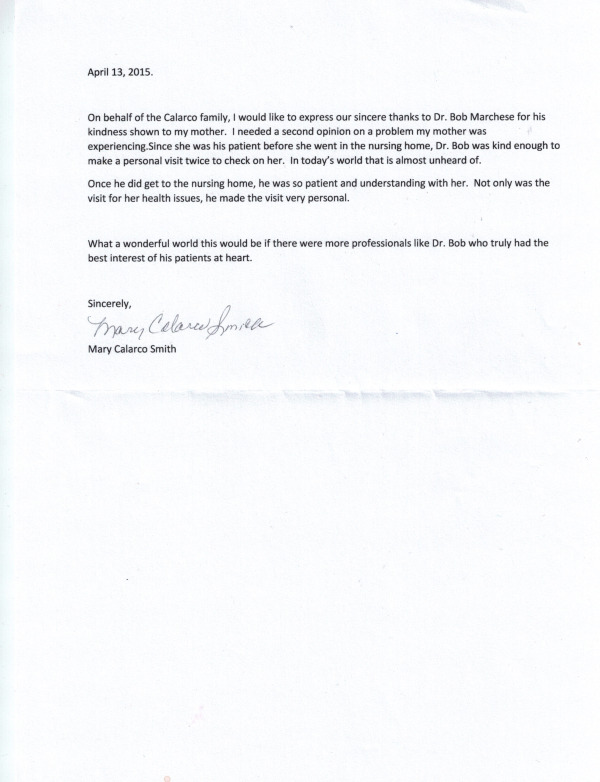 Testimonials and Reviews from current patients that took the time to write to us in appreciation. After my four year old granddaughter advised me that my teeth were “yellow” I decided to do something about it. Upon consultation with Dr. Bob Marchese we decided that my options were to try and whiten my teeth or apply crowns and veneers. I chose the later and the results have been excellent. No more yellow teeth! My main concern with crowns and veneers were that I would have to give up certain foods (i.e. corn on the cob). That has not been an issue. There is nothing that I do not feel comfortable biting into. Dr. Bob and his staff made the whole process painfree and seamless. I had my son’s wedding coming up and we were able to schedule the procedure in time for the big event. Not only has Dr. Bob upgraded my smile but he also has done some corrective work on my teeth done by a another dentist that I went to in the past. I would highly recommend Dr. Bob Marchese for cosmetic and general dentistry needs.